After making a future life regression of my self I found out that I need to be more positive from my life lessons and carmic reactions.Trusting my intuition and healing forward better solutions, people and situations to follow my mission better.Therefore I changed the text from yesterday. I was ambitous day and night to solve everything to learn new things and try them out when others where giving up or going out and wasting away their time with drinking and partying or with charter just because they where were bored. 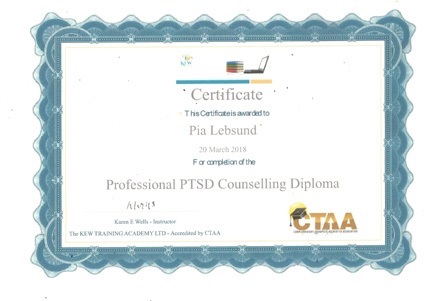 But PTSD is very tricky to handle so I am learning more about CBT as I already practised myself.Actually my son has also CBT as one way of treatment his repetetive behaviours that can be destructive. Pia Lebsund Here is another license in Grief that is also very hard and I wish I did know this myslef when my father died and I didnåt have anyone to support me and didn't have time to mourn him because my son was out of service and he should start a new School that I lobbed in.